The most modern, feature packed, Independent auction platform on the market today. Taking the lane/block auction to the next level. Our auction software is built for both the buyer and sellers customer experience. The Auction Simplified™ platform is filled with useful and innovative features to make your lane style auction a success. Auctioneers Love it: It helps them manage three bidding sources at once, Online, Internet Proxy and Live in the lane and it does it with ease. Auction Owners Love it because bidders get into a bidding battle on-site and online which increases the number of bids per car. Buyers Love it: because they can bid from the car, online and proxy bid if they can't be there. Billing Office Loves it: Bidders get invoices emailed to them as they win cars, they can manage there invoices online or print them out. How Does Auction Simplified's Lane Manager Work? -Load cars as they arrive using our smart phone app. -The smart phone app, compresses photos to make them upload faster saving time. -Once sold block attendant can print invoice, check credit limit on the fly. -Software sends the invoice to on and off-line buyers as soon as the car is sold. Auctioneer can "No Sale" a car or Take a hard 2nd chance offer right in the lane. -See who your top buyers are. -Which auctioneer preforms the best. -Buyers can see the auction results. Our smartphone app gives you the ability to check-in cars right from your auction lot. It allows you to: take photos, build condition reports, scan the VIN, and even post the cars to your website live with just a touch of a button..
No need to create PDF's of your run lists and manually post them on your site, they are posted instantly as the cars are added (or uploaded). It’s a fully automated auto auction website for Indie Auto Auctions. A detailed auto run list engages wholesale vehicle buyers in your indie auction in a new and immersive way. Bidders can create watch lists right from your auction website. Texting bidders with their permission is by far the quickest way to get their attention. With Auction Simplified's Auto Auction Software we make it as simple as clicking a button. 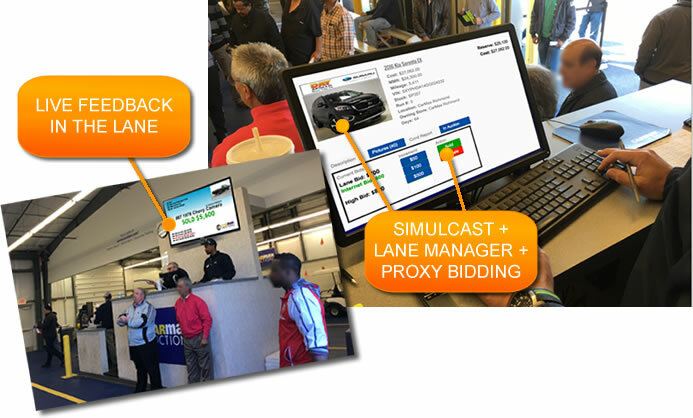 HD simulcast with immersive low cost Live Lane walk-around, is the perfect solution for Independent Auto Auctions who want to offer their bidders more.